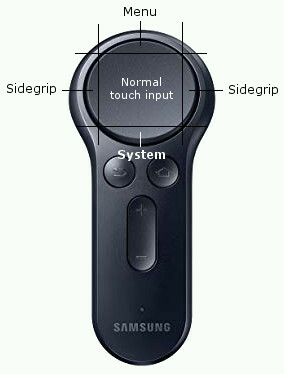 Using your 3-DOF controllers does not require any setup. Just use your controller with your AIO headset as you would normally do and launch VRidge - SteamVR should automatically recognize your controller. All controllers are built differently with various button setups. Most of those hardware buttons are unfortunately unmappable so missing buttons had to be emulated. 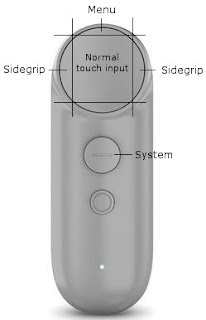 They are mapped to reflect position of buttons on Vive wand. NOTE: Advanced users may want to adjust the threshold where touchpad registers emulated buttons by adjusting EmulatedControllerButtonBoundary line in vridge.cfg. Default threshold is 10% of touchpad. Bottom button is unmappable and recenters view on system level. 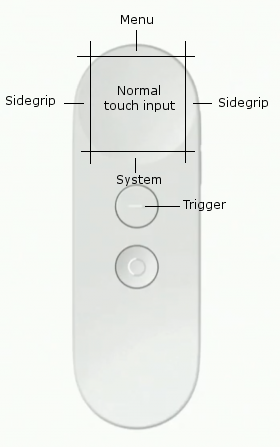 Controller Home and back buttons are unmappable. Long pressing home recenters view on system level. Bottom button is unmappable and recenters view on system level. 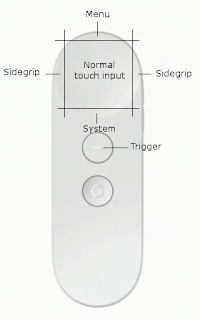 The controller doesn't have a trigger and only has one mappable physical button so it's used as trigger. Hi, first of all - congratulations !!! RiftCat and VRidge is real something, and it really gave me a lot of fun without spending milions of dollars on Vive or OculusRift. It crushes other vr-to-cardboard solutions like TrinusVR (althought there are some games - especially non VR, which works better with Trinus, but for VR apps, RiftCat is the best). There are some minor problems I'm facing with though. I'm using RiftCat on GearVR and I am aware of it's technical limitations in comparision to "real" VR systems. Right now, the biggest of them is how to use controller. It is very good, that your app uses GearVR conroller, the tracking is very good, and I didn't thought, that it will be provided, so this is a big plus, but in many games I can't "grab" anything because my controller is too near me. The examples are: Superhot VR - I can't reach the gun - it's too far away, and my controller doesn't support full environment movements, the same with Bartender VR - I can't grab anything with my hand. There are more games, which doesn't work well (Lightsabre VR, Raw Data, etc), and I wonder, how to make them work. Is there any variable in config file, I could change to move virtual controller away from me, or some other methods? Thank for your reply, and keep doing your work, because it's awesome!